I was not impressed at all with this place. The service was extremely slow and the food was just mediocre. I will not be returning. Stopped at this restaurant while traveling from Morgantown to Columbus based on the ratings. It had a very authentic Italian atmosphere and a very friendly staff. However, I order penne pasta but it was over-cooked. The lovely waitress looked shocked when I mentioned it but agreed to exchange it for spaghetti. Unfortunately, the spaghetti was over-cooked as well which was obvious as the spaghetti looked swelled. It was like eating spaghetti out of a can. Possibly just a bad day in the kitchen. This was one of the worse meals I have ever experienced! We went to Colombo’s with a group to celebrate the holidays and were very dissatisfied! We have not been there for a couple of years and now we realized why! The food and service were awful! I ordered the Prime Rib which was advertised as 12 ounces and ordered it rare with a baked potato with butter and sour cream and a salad! My salad came and it was just lettuce and nothing else and no dressing! I told the server and was told i will get your dressing! After another reminder my dressing came 10 minutes later and everyone else was done with their salads! Mr Prime Rib arrived and what a disappointment! The meat did not look like Prime Rib, and more resembled a flank steak and I bet it weighed no more than 6 ounces! And what was worse it was well done and the server said the tag says medium rare and would not replace my steak! Now the final straw, I never did get my baked potato and I reminded the server 2 times! My wife got Lasagna and it was at best OK and exceptional! I never expected to find a New York style Italian restaurant this good in West Virginia. The staff was awesome the food delicious. I highly recommend it. The chop steak and spaghetti is to die for. Great salad and garlic toast. If you’re in Parkersburg and hungry this is the place. P. S. In won’t cost you a fortune. the world war two potato & whip spread in sealed cup with the famous sealed tube of sour cream. You would expect this in a fast food place not a sit down place. All i can say is maybe there are not a lot of places to eat here . 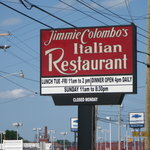 Been to Jimmy Colombo's Restaurant? Share your experiences!